The Notes gadget in Windows Vista allows you to create multiple notes and even multiple sets of notes so that you can organize yourself electronically. 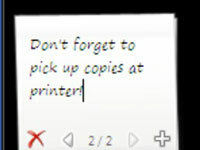 These steps not only show you how to create notes in Windows Vista, but also how to make them look unique so you can organize them and navigate through them quickly. 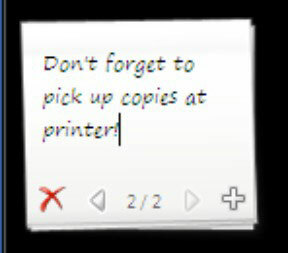 Once you do this, you won’t have to be afraid that your next big sneeze will blow away the months’ worth of sticky notes you have hanging off of your computer screen. 1Add the Notes gadget to the Sidebar and click it. If you don’t know how to add the Notes gadget to your Sidebar, just click the Gadgets symbol (a plus sign) at the top of the Sidebar and double-click the Notes gadget (or click and drag it to the Sidebar). 2Type whatever note you wish. After you type your note you can either click the Add button (the plus symbol) to save the note and move on to the next blank note, click the Back or Forward arrow to navigate between notes, or click the Delete button to delete a note. 3Click the Settings button to tweak your note. 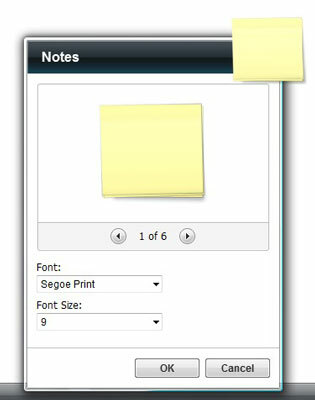 Click the little wrench in the set of tools to the right of the Notes gadget to change the font or color of your Notes text. Use the Font and Font Size fields to modify the font. 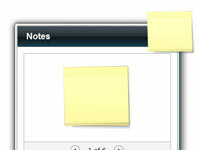 Click the arrows beneath the Notes preview to choose a different Notes background. Click OK when you’re done. By clicking OK, you save all of the settings for your note.